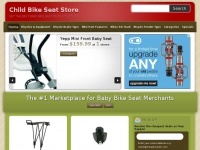 Childbicycleseat.net provides information about a product. The web server used by Childbicycleseat.net is located near the city of San Francisco, USA and is run by GoGrid, LLC. There are many websites run by this web server. The operator uses this server for many hosting clients. In total there are at least 242 websites on this server. The language of these websites is mostly english. The websites were created using the programming language PHP and they are hosted on a Apache server, which runs on the operating system Cent OS (Linux). Due to the robot information on the webpage, the following actions by webcrawlers are not allowed: using the description of the website from the Open Directory project and using the description of the website from the Yahoo directory. All other actions by webcrawlers are allowed. In order to display ads the Google Adsense advertising network is used.